Status: Playing Super Mario Maker for Nintendo 3DS due to Super Mario Maker 2's announcement. This user's favorite character is Yoshi. fan-0 This user dislikes the video game character Wendy O. Koopa. Worst Koopaling from the group. This is likely due to her Mario & Luigi series apparitions. This user wins everytime at a Mini Battle! This user has a particular way to draw Bandits! This user has his own Botanical Garden! This user thinks that the two different colors that can come Needlenoses are a reference to the normal Pokey's original color and the one since Super Mario World. This user isn't convinced enough about many Shy Guys types being the same, or just coincidental such as Flamer Guys and Pyro Guys, Bandits and Snifits being Shy Guys, etc. This user reverts undoes vandalism! Vandals ahead, i report! This user thinks that internal filenames aren't usable for an article name, since they are only romanizations of Japanese names, and may not be the english name, this means the another language template has to be added! This user offers his condolences to Walkazo's family. 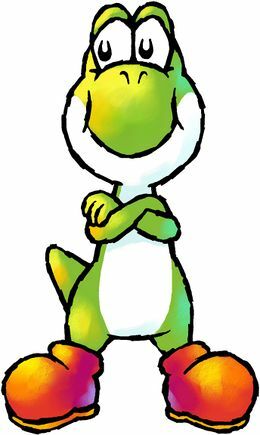 Hey guys, i'm FanOfYoshi, an user who created this account in 26 August 2018. How i usually draw Bandits with the following expression when i make a drawing based on Super Mario World 2: Yoshi's Island. Looks like this Bandit is tryna to fake hint me, huh? Well, if he tells me it's a Dizzy Dandy, i rather take the other one. Sorry for the stretching, i used Paint to resize the screenshot i did. The one i drawed on my custom picture? Is that you again, but with your color from the artwork? When Team Rocket is at it again. Also, beating Naval Piranha before the battle starts, and Kamek saying OH MY!!! should be a meme. Why don't you have an entry on the Player Guide? A minion from Despicable Me? Me when i report someone to admin noticeboard. Beep, Beep, i'm a sheep Shaun the Sheep, i said Beep Beep i'm a sheep Shaun the Sheep! Raphael the Raven on a magic carpet? Or is it another bird? Yeah, Ravens from this game look a bit like Pidgits. I can't tell if this is the Item Flower or a Bandit stealing an item from me. Why you only have the right cheek pink? Was i the only who thought that Wart's "AH! Ribbit!" and "NO! Ribbit! NOOOOOOOOOOO!" would be much more fitting to Prince Froggy each time you hit his uvula and the last hit if they showed both screens in-and-out? Is that mask supposed to represent a Yoshi? I don't have derpy eyes! It looks like a Spiked Fun Guy but its mouth isn't hidden by the pot nor the floor. Seem to be the same size as a normal Spear Guy to me. That's Failian from Yokai Watch! I also wanted to point out that in Japan, they are considered as just Pokeys. Is this what you call an evil frog? That's what i call an evil frog! I don't think Bull's eye Bill and Missile Bill are the same thing. In Japan, Missile Bill is just considered as a normal Bullet Bill, while Bull's eye Bill is separate. I think the Super Mario Bros. 3 section of Missile Bill should be merged with Bullet Bill, while the rest should be normal. Mo-Guragura. Yes, its Japanese name comes from Mogura which means mole. If only i knew internal filenames (those which are definitive romanizations) we're going to be used by saying that it's their english name, i would have removed my "Do not allow the book to be cited" vote, and used "Allow the book to be cited" option, as my preffered option. I allow it to be named after it internal filename, at least, until we get a new official english name. I bet Hamshamcart wouldn't ever like to get an infinite ban. I wonder why is he insisting on models. The english name is Whimp. Currently, i think we should mark it as another language. Case in point: Co Gasagoso. A total romanization. The reason that some enemies have a different design from the main series is that it's to fit to the Woolly World universe. It's not drastic either. But the two Ice Snifits don't even look similar. And it's possibly intended to be something different anyways to fit in the Woolly World. Sure, the enemies aren't always 1:1, but not that drastic either. This one is drastic. Just keeping him on April Fools occasions, but he is not pretty in pink. Splitting MLSS Ice Snifits and YWW ones, as they're unrelated, and purely coincidental, this I already extended this proposal 2 times. Splitting Mega Kantera from Big Lantern Ghost, as they we're neither inspired, nor based, nor intended to be the same thing at all. Merging Giant Raven with Raphael the Raven. Technically it's successful, since i was the proposer and opposed my own proposal. Splitting Green Toady from Solo Toady. Splitting Green Toady from Solo Toady. I initially failed to reach consensus, but due to Doc von Schmeltwick's arguments, i cancelled it. Adding an internal filename template. I saw that the margin of "Keep the current setup" votes was more than mines, so i thought it was going to fail. Doc von Schmeltwick is also on my side, but did not vote. This user thinks that article named after their internal filenames (when romanizations only) should have an another language template, or moved to their final Japanese name in accordance to policy. This page was last edited on April 1, 2019, at 14:17.